The all-new 2016 Chevrolet Malibu, one of Chevrolet’s most popular vehicles, will automatically slow or brake the car for pedestrians, General Motors announced Friday. GM said that in all, the 2016 models in the Buick, Cadillac, Chevy and GMC fleets will have a combined 22 active safety technologies. These include both passive systems like curb- and rear-view mirror cameras to active ones which tell the driver they’re about to hit something — or just stop the cars automatically. 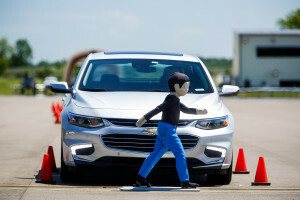 The technology was touted Friday as GM officially opened a 52-acre Active Safety Test Area near Detroit, just a few days after the similar University of Michigan Mcity opened in the state. As several experts have pointed out, such systems tend to cut crash frequency but increase severity because of the expense of the technology — though Progressive has noted that loss ratios still saw a net decrease. If the insurer’s findings hold up, that’s bad news for body shops. The technology appears to be on mainstream GM vehicles too, not just low-volume exotics or luxury brands. Chevrolet Malibu sales were down last year, but customers still bought nearly 190,000 in 2014, according to GoodCarBadCar. And a GM official bragged about how even Chevy’s cheapest car — the Spark — made some safety alerts available to drivers. The Malibu will also complicate life for collision repairers through its high-strength-steel intensive body, which will require embracing new tools and methodology than mild steel. The hard, thin, and — above 799 megapascals — heat-sensitive materials cut about 120 pounds from the body of the vehicle. On the luxury front, GM also announced the pedestrian-braking technology would be on its aluminum-intensive Cadillac CT6. Besides pedestrian auto-braking, GM will also be offering automatic “City Speed” slowing or auto-braking which reacts to other vehicles. The GM cameras described above offer a “wider, less obstructed field of view” on the rearview mirror and “a view of the scene immediately ahead of the vehicle” in low-speed situations like parking. But GM also noted that night-vision displays would be available too. We’ve asked GM for more details about which vehicles would have which specific technology and whether it’d come standard or as an option. Continue to check Repairer Driven News for updates. Toyota announced in April that it would roll out low-cost advanced, safety packages to nearly all Toyota and Lexus vehicles, and shortly afterward, Nissan said it would make automatic braking standard in Japan. GM also noted it would study vehicle-to-vehicle technology — standard on the 2017 Cadillac CTS — at its test area. V2V systems let cars exchange information and likely will allow greater autonomy for vehicles.